First known as "Lower Crossing", Momence was named after a local Potawatomi, Isadore Moness. Momence was first platted by Dr. Hiram Todd in 1846. In the early 1800’s, the father of Chicago, Gordon Hubbard, as well as other traders of the day, drove teams of men, oxen, and horses from the fertile hunting grounds of Danville, Illinois and the neighboring Wabash Valley to “South Water Street”, a common reference to the large settlement north of Momence that was to become Chicago. In 1832 the Potawatomi Indians ceded their land to the United States Government in the Treaty of Camp Tippecanoe. The Potawatomi left the Kankakee Valley and moved to a reservation near Council Bluffs, Iowa. As word spread about the government acquiring the land, immigrants from New York and Vermont moved west to Kankakee County, locating mostly in Momence. A more aristocratic group, they were storekeepers, craftsmen, businessmen, and professionals. The modern railroad crossed the river at Momence following the Civil War. Intended and unintended changes to the river, as a result of “improvements” along with the construction of numerous bridges and dams in Momence during the late 19th and early 20th centuries, changed the look and depth of the Kankakee River at Momence. Yet another Kankakee County attraction was the 1890 Hay Place in Momence. 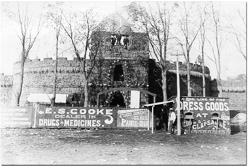 The 206’ x 166' castle-like structure was made of hay bales and featured agricultural displays, bandstand, and dance floor. The second and final Hay Place was reconstructed in 1891 to be even larger, 217' x 224'. Large, beautiful homes were built in the late 1800’s, many of which remain today. As Momence entered the 20th century, new forces shaped its evolution. The impact of two major wars, a 10 year depression, and massive industrial modernism crested challenges and opportunities for Momence as it did for every community in the country. The sudden emergence of World War I in the early 20th century took local boys from Momence only to see them return and make the city more modern. As with all wars, a burst of local improvements following the first war, and the automobile led the way to American modernization. Livery stables became automobile centers and dirt streets were paved over with concrete. The Depression years were clearly difficult for all Americans, but projects like the new high school and growth in civic groups bolstered the community and moved Momence forward. At the height of the Depression, Momence held its 100th Anniversary in a grand way, and with a history of celebrating life’s good times, the Momence people launched the Gladiolas Festival, inspired by Roy Hess, in 1938, and the festival still lives on today as Momence’s trademark. After World War II, entrepreneurs, many of them veterans, created what some would say was the peak of Momence’s economic strength to date. Names like DuMontelle, Astle, Speith, Therien, LaMotte, Cromwell, Reising, Thyfault, Case, Benoit, Mullady, Jensen, Mackin, Butterfield, Petkunas, Stetson, Lustig, Wheeler, and Orr built solid businesses that thrived in the postwar boom years. As the 1960’s waned, a world of economic change would not leave Momence untouched. Retailing was now being placed in the hands of multinational and regional brands, pricing local proprietors out of the market all across the country. Interstate development would bypass Momence, and malls consolidated shopping throughout America. In the 1970’s Momence beautified its downtown by creating antique-style imaging on storefronts to attract continued business. Today, this trend continues with Main Street Momence leading the way. The downtown district was placed on the National Register of Historic Places in 2006, and the Main Street program continues its mission of preservation and improvement. Most of the above content was obtained from the book, “Images of America, Around Momence” by Kevin McNulty, Sr., published by Arcadia Publishing Copyright © 2007, and used with the permission of the author. Printed copies of this very interesting book may be purchased at the Main Street Office, and online at Amazon and Barnes and Noble. All photographs above are courtesy of the Graham Historic House. Graham Historic House and Museum website.